A tomb may not seem like a place you would want to visit, but the General Grant National Memorial is something magnificent to behold. Before he was President Grant, General Ulysses S. Grant distinguished himself by leading the Union armies to victory during the American Civil War. Not only was he a skilled soldier, he was also instrumental in the ratification of the 15th Amendment of the Constitution (granting the right to vote regardless of "race, race, color, or previous condition of servitude") and the establishment of the National Park Service. After serving two terms in the White House, President Grant died at the age of 63 from throat cancer in upstate New York. With the approval of Julia Dent Grant, President Grant's wife of nearly 40 years, William Russell Grace, the Mayor of New York City at the time, spearheaded the campaign to have a national monument built in New York City in President Grant's honor. The Grant Memorial Association held a competition for the tombs design and on April 27, 1891, construction began. 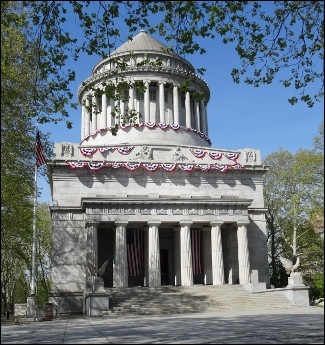 On April 27, 1897, the 75th Anniversary of Grant's birth, Grant's Tomb was dedicated. Over one million people attended the dedication. The tomb is stately and beautiful, constructed of over 8,000 tons of white marble. 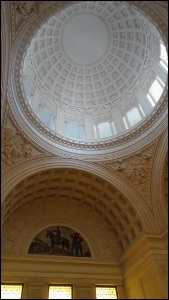 It has a magnificent domed ceiling that's a wonder to see towering above your head and it's well worth the visit, especially if you're a lover of fine architecture or an American History buff. If you've heard the riddle "whose buried at Grant's Tomb?" and you think the obvious answer is "Ulysses S. Grant", you are wrong. If you visit the tomb, you'll understand why. Take the #1 train to the 116th Street-Columbia University station on Broadway. Walk six blocks North to 122nd Street, and two blocks West to Riverside Drive. For a quicker commute, take the #2 or #3 express trains to 96th and change over to the uptown #1 train. M11 bus and get off at Amsterdam Avenue and West 118th Street or take the M104, M4 or M5 bus to 122nd Street and Broadway.